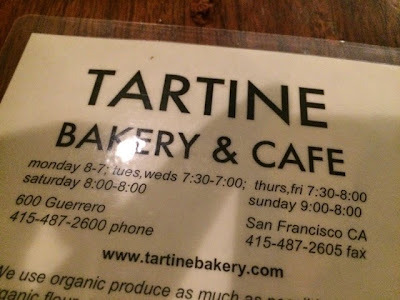 On my to do list whilst visiting San Francisco was a delightful bakery called Tartine. After a busy day of China Town, trams and shopping we realised it was way too late to stop in there for a spot of lunch but figured we could pop in to get a cake or a pastry and save it for after dinner later on. 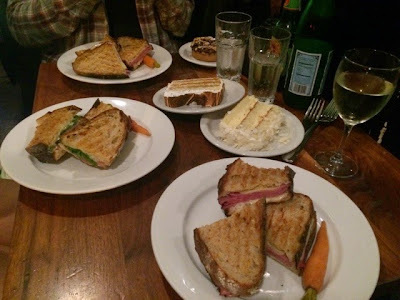 When we arrived however, we discovered they had a great selection of sandwiches and savouries and decided to eat there for our evening meal, and boy was that a good decision! 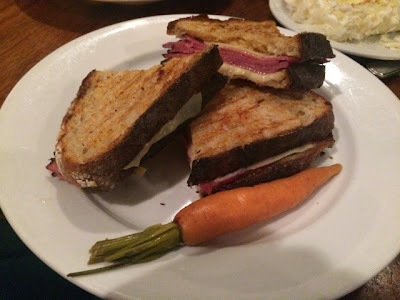 I went for the pastrami hot pressed sandwich which came packed with plenty of meat, oozing with gruyere cheese with a light smattering of horseradish, which really packed a punch. Rather oddly it came served with a lone carrot on the side which seemed a bit random until I bit into it to discover it had been pickled and was actually really tasty. The sourdough bread that enveloped this delicious snack was really good and had just the right amount of chewiness to it whilst retaining its crisp freshness and was toasted to perfection. 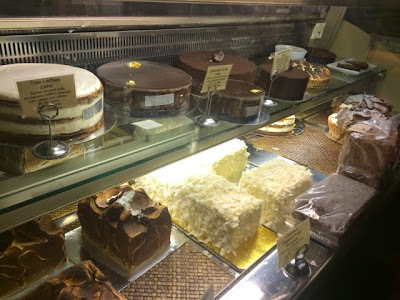 The enticing display of cakes on offer made it so difficult to choose what to have for dessert and I was going to go for the lemon tart and then changed my mind and managed to catch my friend just before he placed our order. I eventually went for the passion fruit & lime Bavarian cake, which was nothing short of heavenly. I’m not even exaggerating when I say this was quite simply the best cake I’ve ever eaten in my entire like. 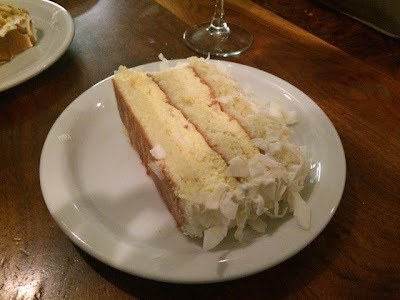 The light sponge balanced beautifully with the cream and coconut on the outside and the flavours of the lime cream and passion fruit jam spread between the layers was like a taste explosion in my mouth. I’ve really never had anything like it and it just all worked so perfectly together. I’ve even ordered the Tartine book from Amazon with the recipe in so I can recreate it at home as there is no way I can go the rest of my life without tasting this incredible cake again. As much I will sing the praises of my choice of dessert at Tartine, there are plenty of other mouth wateringly tasty options. The meringue on the lemon meringue cake was fantastically fluffy whilst the frangipane tart was surprisingly light. If you’re ever in San Francisco I would highly recommend this as a destination worth making the effort to find. 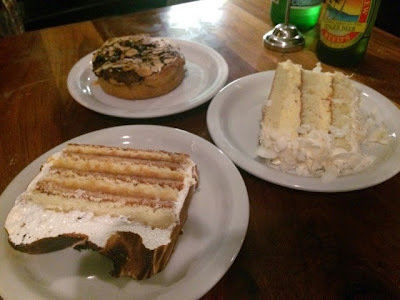 Don’t just stop by in any old cake shop you happen to pass, make the trip up to Guerrero Street and try these delights for yourself. There are frequently queues out the door but it’s unbelievably worth it. I can’t wait to get my hands on the book and try some of the bakes out myself.